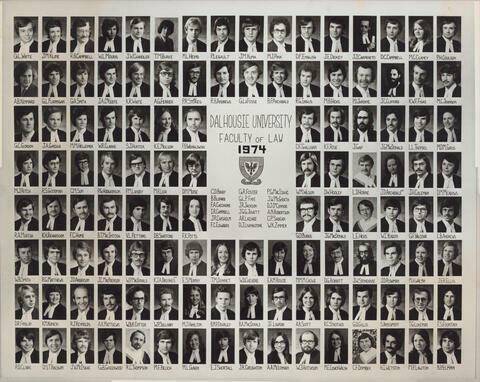 File contains three copies of a composite photograph of the 1974 graduating class of the Dalhousie University Faculty of Law. 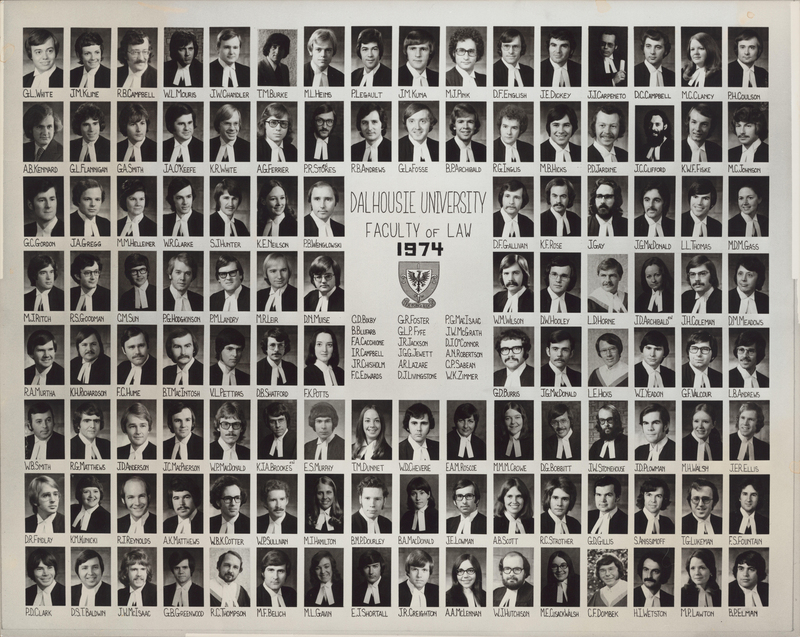 The photograph consists of portraits of G. L. White; J. M. Kline; R. B. Campbell; W. L. Mouris; J. W. Chandler; T. M. Burke; M. L. Heins; P. Legault; J. M. Kuna; M. J. Pink; D. F. English; J. E. Dickey; J. J. Carpeneto; D. C. Campbell; M. C. Clancy; P. H. Coulson; A. B. Kennard; G. L. Flannigan; G. A. Smith; J. A. O'Keefe; K. R. White; A. G. Ferrier; P. R. Stokes; R. B. Andrews; G. LaFosse; B. P. Archibald; Inglis, R. G.der, S. H.; M. B. Hicks; P. D. Jardine; J. C. Clifford; K. W. F. Riske; M. C. Johnson; G. C. Gordon; J. A. Gregg; M. M. Helleiner; W. R. Clarke; S. J. Hunter; K. E. Neilson; P. B. Wenglowski; D. F. Gallivan; K. F. Rose; J. Gay; J. G. MacDonald; L. L. Thomas; M. D. M. Gass; M. J. Ritch; R. S. Goodman; C. M. Sun; P. G. Hodgkinson; P. M. Landry; M. R. Lier; D. N. Muise; W. M. Wilson; D. W. Hooley; L. D. Horne; J. D. Archibald; J. H. Coleman; D. M. Meadows; R. A. Murtha; K. H. Richardson; F. C. Hume; B. T. MacIntosh; V. L. Pettipas; D. B. Shatford; F. K. Potts; G. D. Burris; J. G. MacDonald; L. E. Hicks; W. I. Yeadon; G. F. Valcour; L. B. Andrews; W. B. Smith; R. G. Matthews; J. D. Anderson; J. C. MacPherson; W. P. MacDonald; K. J. A. Brookes; E. S. Murphy; T. M. Dunnet; W. D. Cheverie; E. A. M. Roscoe; M. M. M. Corwe; D. G. Bobbitt; J. W. Stonehouse; J. D. Plowman; M. H. Walsh; J. E. R. Ellis; D. R. Findlay; K. M. Kinicki; R. J. Reynolds; A. K. Matthews; W. B. K. Cotter; W. P. Sullivan; M. J. Hamilton; B. M. P. Dourley; B. A. MacDonald; J. E. Lowman; A. B. Scott; R. C. Strother; G. D. Gillis; S. Anissimoff; T. G. Lukeman; F. S. Fountain; P. D. Clark; D. S. Baldwin; J. W. McIssac; G. B. Greenwood; R. C. Thompson; M. F. Belich; M. L. Gavin; E. J. Shortall; J. R. Creighton; A. A. McLennan; W. J. Hutchison; M. E. Cusack Walsh; C. F. Dombek; H. I. Wetson; M. P. Lawton; and B. P. Elman arranged in eight rows. C. D. Bixby; G. R. Foster; P. G. MacIssac; B. Blufarb; G. L. P. Fyfe; J. W. McGrath; F. A. Cacchione; J. R. Jackson; D. J. O'Connor; I. R. Campbell; J. G. G. Jewett; A. N. Robertson; J. R. Chisholm; A. R. Lazare; C. P. Sabean; F. C. Edwards; D. J. Livingstone; and W. K. Zimmer are listed as missing from the photograph. One of the copies is warped around the edges.